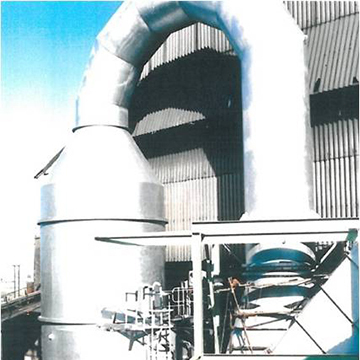 Cyclonic spray Scrubbers uses the features of both the dry cyclone and the spray chamber to remove pollutants from gas streams. This is an air pollution technology in which the inlet gas enters the chamber tangentially, swirls through the chamber in a corkscrew motion, and exits. At the same time, liquid is sprayed inside the chamber. As the gas swirls around the chamber, pollutants are removed when they impact on liquid droplets, are thrown to the walls, and washed back down and out. Cyclonic scrubbers are generally low- to medium-energy devices, with pressure drops of 4 to 25 cm (1.5 to 10 in) of water. Therefore, they are most often used to control large-sized particulates. This type of technology is a part of the group of air pollution controls collectively referred to as wet scrubbers. KARYASIDDHI Cyclonic Scrubbers are designed to meet your exacting requirements in all major industry segments and manufacturing processes.